Have decided to document in serial all inquiries and complaints sent, after failing to track the many many complaints sent since years. GIZA ZOO or nearest governmental zoos, would soon await confiscation and new comers...as the Giza Zoo and all the governmental zoos acts as rescue centers... but, would the trade stop? http://sphotos-a.ak.fbcdn.net/hphotos-ak-snc7/487628_10151483592635914_507015434_n.jpgBEING SOLD IN EGYPT FOR 4000le يباع فى مصر في مخال بيع ادوات الزينة ب 4000 جنية....... !! Mohamed Ali Tag Elden and Dina Albashear like this. Dina Albashear Mohamed Ali Tag Elden im serious i saw it my self for sale!!!!! Dina Zulfikar كده بقي يبقي محتاجين يفتحوا حديقة حيوان ثانية ... لن الحقيقة لو فعلا تم السيطرة و الرقابة ستصادر الاف الحيوانات ...حتروح فين المصادرات.... و سيظل المصدر يستورد و يبيع... و الكراثة تكبر و تكبر ... و حدائق الحيوان تملأ مصر.... ؟؟؟؟!!! ده كلام ده...!! Spoke to Dr. Loay El Sayed, Wildlife Manager of EEAA in the morning, told him about the complaints again about Nada Land. He listened and asked me to get back to him end of the day. As promised, spoke end of the day to Dr. Loay El Sayed, who stated that he talked to the owner of Nada Land and asked for clarification about the current conditions of animals in his licensed facility. 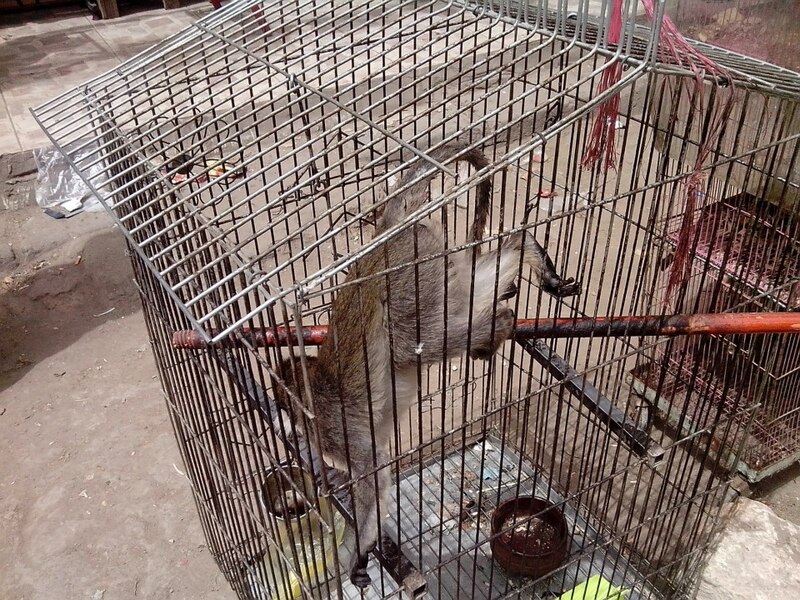 The owner – in the words of Dr. Loay was as transparent as possible – stated that many animals have been returned to the main supplier as per recommendations made by EEAA since the day they inspected the facility. The European gazelle, one, is kept indoors because the weather is cold, the internal or night enclosure of the gazelle is big enough. 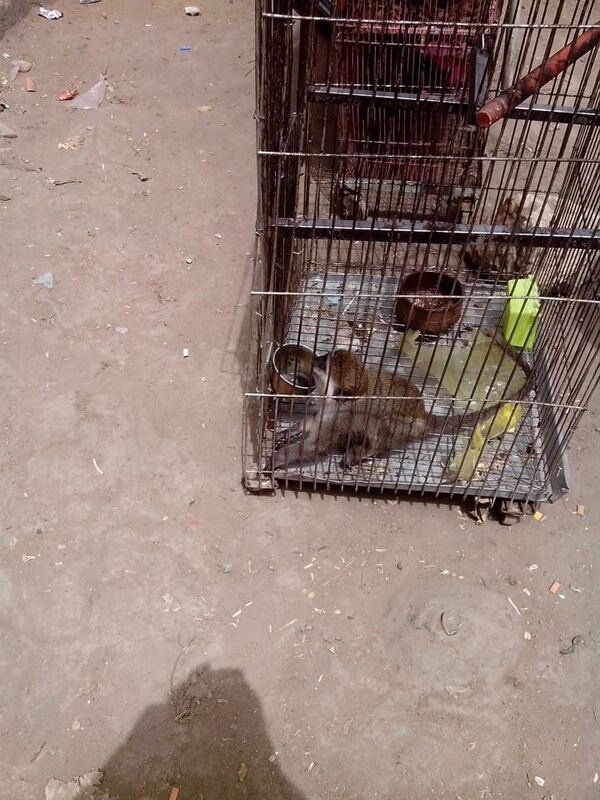 The owner has one baboon and two monkeys. 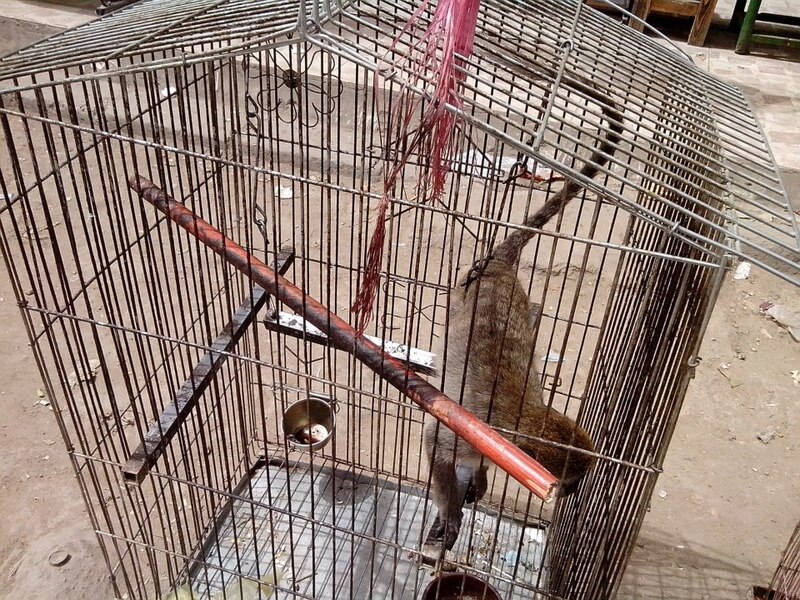 The owner was confronted that the monkey is not kept in the complying cage as was stated by EEAA, the owner promised to immediately move the monkey to the proper cage. The owner has now few reptiles and are being kept single in appropriate containers. The owner when confronted about the lack of food or water said why should he not provide nutrition or water, he does, losing an animal is a loss to his business. About enrichment, Dr. Loay told the owner that cooperation with ACE Egypt and animal lovers is to be welcomed, the owned him before a lot. As soon as this can be arranged, with ACE Egypt in Luxor - files about substrates would be delivered to the owner. As this conversation took place through phone, I asked Dr. Loay for a meeting at his convenience, to write and submit complete report next Saturday at 4:00pm. Dr. Loay knows that I am providing updates in public about this issue. 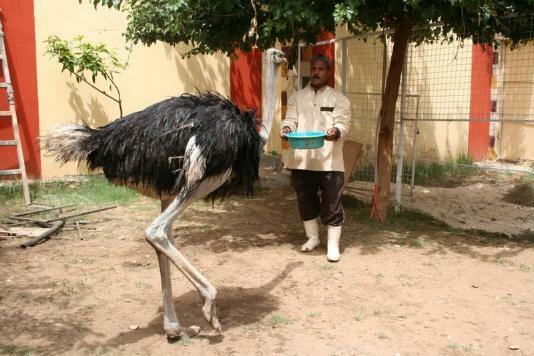 Today is 14 January 2013 - since May 2012, scroll down, see the report about Nada Land Zoo - Luxor - Egypt - reports sent through emails to authorities, and by phone, and by mobile, we targeted both: EEAA and Wildlife Unit, and also sent emails off course to GOVS. Nothing has been done, as per report by Animal People who followed Helen Bailey and another new recent report by Louise Phillips - animals are suffering, most are dead remaining very few. Please scroll down and see the number of animals which were brought by the owner without license back in May 2012, and compare to the numbers currently alive!!!!!!!!!!!!!!!!!!!!!!!!!!!!!!!!!!!!! Louise Phillips shared Egypt Unveiled Photography'sphoto. Hello Dina, this is El Nada Land in Luxor. It looks like the conditions are terrible. 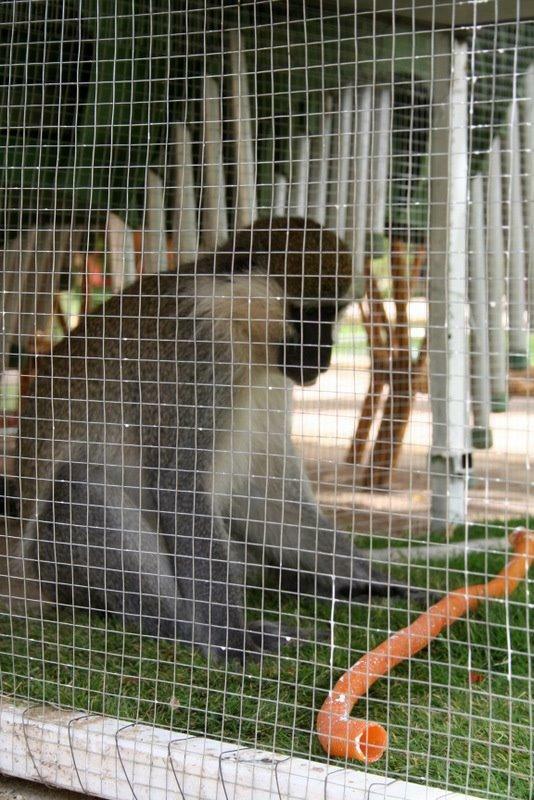 This monkey kept alone in a small cage. Do you know this place? Can anything be done? Robbie lives in a small cage in Luxor. She would love to have company, but has only the other animals around her and the visitors that arrive daily to take her photo. Louise Phillips Dina thank you very much for your reply. I was just reading about Kim from ACE helping. I will also contact her. Thank you very much again. Dina Zulfikar I think also Khaled Omary - friend, hotel manager, and also animal advocate may help and speak to the owner if he is in Luxor and not Aswan. Louise Phillips Dina, can I write to Wissam Emile and Khaled Omary in English? Louise Phillips I will try to find the name and contact of the owner of El Nada Land. I wonder if he speaks/reads English? Dina Zulfikar Yes off course, talk to all, I just spoke with Dr.Yousria AbdelL Rahman - manager of protected area in Sharm El Sheikh - I also see her as the iron woman ranger - she said she would talk to the nearest rangers unit to Luxor, and ask if they would be able to assist and provide her on friendly basis. Dina Zulfikar We know the name of the owner of Nada Land... Helen and Ace Egypt Luxor have all information. Helen Bailey ACE do not have contact with El Nada land now, but I visit regularly. The owner has not got his licence and will not. Please PM me for more info . Dina Zulfikar Helen Bailey - glad you are online - are you sure the owner did not get license yet? my information is different from Luay? also I have contacted Dr. Yousria AbdelL Rahman Manager of Protected area in Sharm El Sheikh, she is a great lady and bionic too... I explained she said she would be able to help us and contact the nearest Protected area to Luxor , ask the rangers if they could support us. Dina Zulfikar Yes Louise Phillips all speak very good english. Helen Bailey The ververts had a baby, it died. Dina Zulfikar GOD HELP US HELP THE ANIMALS - I promise you all, I will try something tomorrow... aside we try the options we currently have, do it ourselves with the help of one another, supporters, rangers, OR authorities who are willing to play their role. Helen Bailey I worry for Robbie and have said so...the fallow deer is severely depressed and now the ververt monkey with his injuries...They are only capable of looking after chickens and pigeons..
Dina Zulfikar Louise Phillips I may need your direct contact , mobile if you would... can I have it please? post message please. 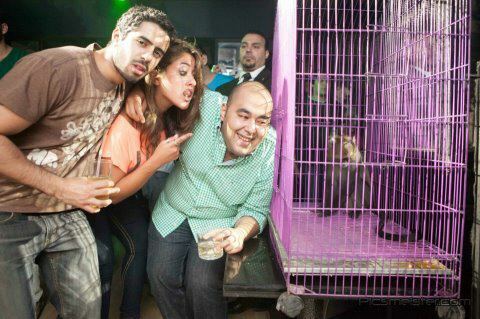 A monkey trapped in a cage for entertainment, at Cairo White Club. 65 Mohy El Din Abou El Ezz St.
السلطات عارفة كويس زي ما احنا عارفين لكن فيه ناس فوق القانون!!!!!!!!!!!!!!!! I received the complaint here under, with photo, evidence and address. I do hope and wish the Wildlife authorities of Egypt raise focus, attention, and campaign through brochures, website, facebook group,l about what is allowed and what is not allowed. Currently I believe all of Egyptian pet shops trade in wildlife, and seemingly rest houses, restaurants, and night clubs. Confiscating is the end result, but what about precaution measures? Received report through mobile (available for investigations) , Italian Circus operating in Egypt, currently is using lion cubs in photo sessions and handling, cubs are declawed and injured, one already lost it's eye, general conditions of animals is so bad, all in horrible conditions. We spent about 4 hrs at the 'Coffee shop' today, or as some prefer to call it, the zoo. A meeting with the new Manager of the establishment was both disturbing and upsetting, as we were told that no-one knew what to do with the animlas and no one cared. That is what we had thought since day one, but here it was being verbally confirmed to us and it was the final straw. Despite this, after hours of talking and working with the owner, the Manager and Luxor Veterinary Services, small changes were implemented that we had been fighting for, over the last 5 weeks. Robbie, my monkey, has a dead tree to climb and sit on. He will also have a larger area to move in when the welder comes tomorrow, now under the shade of a tree and even a fan blowing over him. I went inside the cage with him today and he was just like a child. He jumped on my shoulders, sat and tickled behind my ears, looked for 'Things' in my hair, playfully used me as a springboard to get to the top of the cage, sat in my lap and gave me a cuddle, which brought tears to our eyes. He just wants company and has even started to chatter now, lying back against the cage , so you can tickle behind his ears, stroke his arms, hold his hand and just pet him. It is an amazing experience. He wasn't so keen on one of the Veterinary Services Doctors and whacked him in the eye! He also goes mad when the man that 'Feeds' the animals goes near him, he goes into attack mode! Another monkey escaped, fleeing next door to the theme park, I felt her freedom as she ran and jumped over the empty rides. She had an hour before we managed to catch her and return her to her male, who was frantic without her. So we made headway today and tomorrow the Egyptian Environment and Affairs Agency from Aswan visit. We should know what is going to happen tomorrow. They do not have a licence and so they will possibly confiscate the animals and then what? 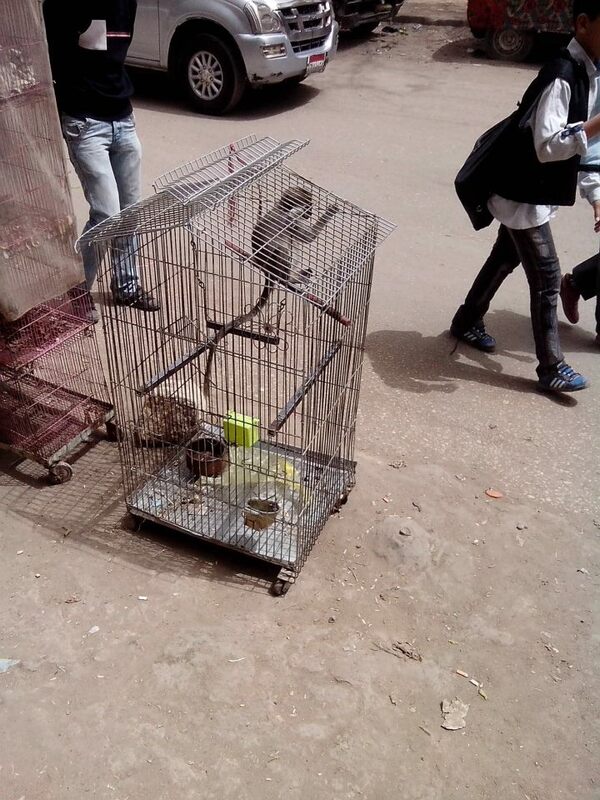 They are sent to Giza Zoo in Cairo, where all confiscated animals go. This is not something we want, as they may well be better off where they are. It is not a decision to be taken lightly, we may have to try and rehome the animals, returning them to the supplier in Cairo is not an option either I have been told. This is the view that Robbie and his friends see everyday, week in week out. People staring, poking sticks through the cage, hitting the cage trying to make them move, screaming and shouting and feeding them any rubbish they can find on the floor. Again each day: for the attention of CITES Egypt, Widlife offices, Central Zoos ..EEAA, ALL, Giza Zoo - received this complaint yesterday: Yesterday i passed in front of the circus that belong to Faten El Helw in Heliopolis and they had two lion cubs in a cage on the pavement in front of the circus to attract people to the show. What can be done about it?? 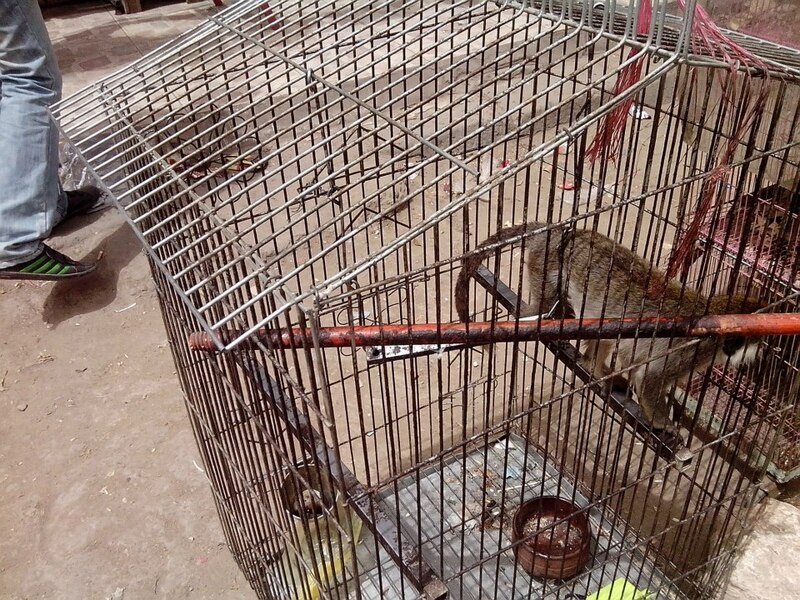 police report filed at the Central Environmental Police Unit in Cairo; confiscation took place immediately, :police report of Sharm El Sheikh is not finished yet, cub and cobra are still held in Sharm El Sheikh EEAA until report is finished and then, animals are transferred to Cairo Giza Zoo, the offiicial recognized rescue center. 755 Wadi El Natroun, 2009. Date 24, March 2009. At 3:00pm Mona Khalil (ESMA) receives a call from Riham (tour leader and volunteer of AWAR group) stating that she has a group of tourists (Spanish), on their way to Alexandria they stopped at Omar's village, Cairo Alex Road for snacks, only to see a photographer 17 years holding a cub (lion), starving, dehydrating, completely sick condition, the photographer insists that people and children take photos with the cub for few dollars.. Riham's tourist group felt appalled and would not leave until a solution is found to this poor lion cub. Riham called Mona Khalil, Mona Khalil called Dina Zulfikar. They discussed the matter and decided (line open) to make all necessary calls to save this cub. Fist calling the environmental police, the major in charge (the one we know) was on a mission, and said he would deal with this matter next day. In parallel another call was made to Dr. Ragi Thoma, Manager of CITES Egypt and Wildlife, Dr. Ragi said he had been following previous complaints (some by us already since months) and matter is completely in the hands of Environmental Police, concerned with confiscation. In parallel, a call was made to tourist police (127), line is temporary out of order, (remained out of order until night, until now 10:30pm night line is temporary out of order). In parallel a call was made to the owners of Omar's Oasis, we were informed again that the cub does not belong to Omar's Oasis, however, thankfully, we asked the wife of the owner to proceed talking to the manager in the Omar's Oasis and to warn him to take this photographer out. On the other line same time, Dina received call from 122 police emergency stating that police unit of Beheira governorate (the nearest to the location) is seconds from the Omar's Oasis. Mona Khalil on the third line (kept opened) told Dina that the Manager will let go the photographer , Mona said she will keep the manager on phone with her in order not to warn the photographer to leave. The police unit of Beheira governorate arrives and arrests the photographer, 17 years old and the cub. Both Mona and Dina call Dr. Ragi Thoma to inform him of the action taken. Dr. Ragi provides the contact of General Osama, Vice general director of <?<span>Egypt’s environmental Police. Call made to General Osama, who acts promptly, arrange with Dr. Ragi to pick up the lion cub from Beheira Police station, arrangements made sending a vet from the zoo and a car. The cub hopefully would arrive to either Giza or Alex Zoo by tomorrow, to be treated and according to laws and convention confiscated animals are handed to the zoo. All contacts of all parties are available. Miss. Rania the tour leader for taking initiative and positive action of reporting. Vice General Osama, Vice general director of Egypt’s environmental Police. Wonderful coalition of ESMA and AWAR. We are getting involved, first round clash started, we are following raising the matter with Ahram newspaper Al Masry, Ministry of Culture media center Mr. Ahmed Salah, Environmental Police vice President General Osama, Mr. Khaled Salah in charge of circus unit Ministry of Culture, proceedures are taken to take Helw family to court. Inquiring about the lion cub today, we found that the vet and vehicle sent by CITES Egypt was unable to find the lion cub at the Wadi El Natroun police unit of Beheira governorate. The lion cub, and the boy, 18 years old were released, the cub was handed to Mamdouh El Helw, lion trainer and owner of the Circus of Agouza, National Circus. Currently Environmental police, vice director General Osama is filing charges against the Helw family, according to CITES, and environmental police, the HELW family has no right is displaying cubs or animals, according to clause 28, article 4, for year 1994, they have no permission from the environmental authority or the CITES Egypt. 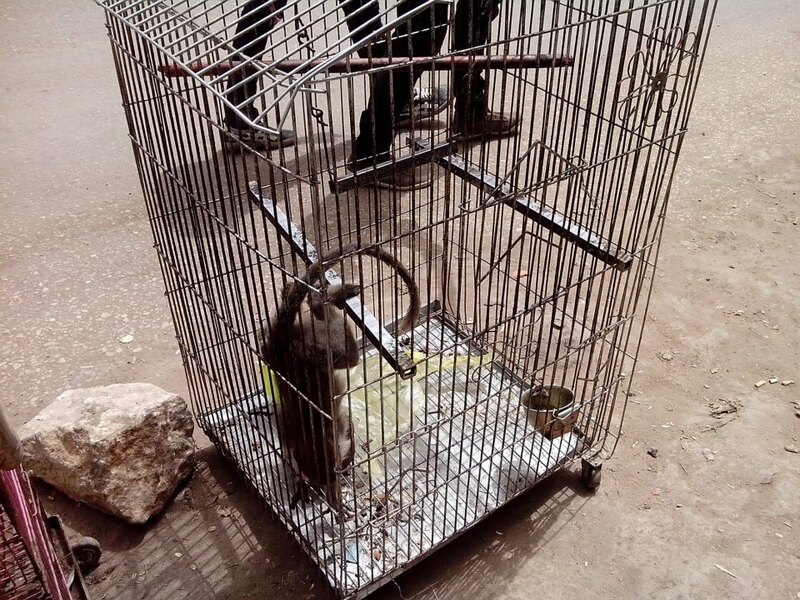 Received call from environmental police, cub delivered now to Giza Zoo. The cub was delivered today to Giza Zoo at 8:45pm, in horrible condition. I was told from Envir. police that there was a misunderstanding the cub was delivered to the three boys now arrested and not HELW family. When I inquired about the cub health condition in Giza Zoo, they said in horrible state, broken back, broken tail, teath, suffering, hemorage in head, they had to put the cub to sleep humanely. I found out that Anouchka, a french woman who has a welfare org. in the zoo, at the same time.. how did she know, she said the brother of Hussein arrested told her. In Shabramant, Ezba village coffeeshop..
How did you know this cub is the cub confiscated? from the brother of Hussein, I knew about this cub and 5 others in Ezba village in Shabramant, Ezba coffeeshop. Al Mosawer magazine published pictures of lion cub confiscated on the 24th March, delivered to zoo on the 26th, struggling life.. in poor state. After publishing the accusations by Dina Zulfikar, coordinator of AW group in Egypt, against Helw Family, accusing some of them of smuggling lions and wildlife, and accusing them of not having permits from Ministry of Environment to make the show of lions in circus. Faten El Helw, Lion trainer in the circus answers the allegations of Dina about legality of renewing lease of circus to Helw Family, and Dina's words that the European circus is just a way out to find permits to Russians who are unoccupied, and the incident of a Sudanese woman injured by a lion while she was taking photographs with in the circus..
Faten stated: All those allegations are lies, bad faith , no one has proof of, the circus land is owned by Cultural Section of theatre performance, and is not rented to Helw or other failies , in cases of running the circus in cooperation during July and August, this deal is made through a tender, which guarantees income and profit for the circus all year round. About alleged accusation from the lady whom her name is mentioned above, I address her to make searches and be precise, the Russian circus is on top in the world in circus acts, and whoever comes to work in Egypt are the best, they are paid and insured, and they praise working in Egypt. I wished Dina Zulfikar seeks the truth about the story of the Sudanese lady whom she said was injured by a lion, to find out that Faten El Helw has nothing to do with this, it seems that some are seeking publicity on the expenses of other people reputation after all now seem to find a way to link Egypt's reputation. Captain Mohamed El Helw assured that alleged accusation of him taking the cub which was confiscated in Wadi El Natroun from Police Station is not true., and all she said to Wafd newpaper is alleged, because being handled a cub confiscated has to be done through police procedures and I challenge her to bring this police report which states I was handed the lion cub., Captain Helw also said all charges she made against Helw family of smuggling is not true., as already they posses many wildlife animals as official employee of the govs. As he was employed by Govs. As a trainer and he shared and performed his acts in various countries in the world., he said he is also registered in CITES and Wildlife sector, which the coordinator of AW alleged says that he has no permit, what she does not know is that any animal out of Egypt requires permit of CITES, and his animals are all recorded in files, the CITES papers are considered passport of animals Dr Ragi Thoma, Manager of Wildlife in Giza Zoo knows all the animals, recorded in their records. This campaign against him has nothing to do with animal welfare, as he considers the animals his family, all, represent Egypt well nationally and internationally.. She, should not worry about the animal rights which he owns, she should better lay concern on human rights lost of the Palestinians and other citizens of countries which are not practicing their rights. Why Should the use of wild animals as photographic props be banned? Why individual wild animals shouldn't be exploited as photographic props? On 24/03/2009 compassionate travelers contacted us to inform and provide details about the exploitation they have seen, which spoiled their holiday. A police report was filed (755) and as a result the lion cub was confiscated and delivered to Giza Zoo. The medical examination by Dr. Refaat Abd Elhaseib revealed the intolerable suffering of the lion cub which died as result in less than a week. Beware of the serious animal welfare implications or the risks to public health and safety. Direct animal/human contact should be avoided and where it does occur, it must be for limited periods of time, making sure welfare of the animal(s) is not jeopardized. Any animal contact must be continuously supervised and tourists should be made aware of the risks. Many diseases can be transmitted from animals to humans. There is a wealth of evidence to suggest that direct contact with animals poses a significant risk of zoonotic disease transmission which may result in serious illness or even death. The increasing trend for animal attractions to encourage more ‘hands on’ encounters with animals therefore presents a very real threat to public safety. Despite this, many animal attractions are seemingly unaware of or fail to publicize the risks, and they do little to implement preventative measures to minimize disease transmission. Results and conclusions are concise and relate back to objectives. All animal welfare societies and groups should encourage people to proved details about the exploitation seen. Awareness campaigns of the serious animal welfare implications and the risks to public health and safety. There is No God-damn reason for animals to be tortured this way. I couldn't understand what I was seeing, as the position of the body of the little baby lion did not appear normal. I would have No Problem taking a gun an shooting any human male in the head that I saw with a baby animal, especially one in such painful condition. This little baby was Literally Broken because the Bastards who had him did not know, nor care, about his welfare - only the Stinking Money that they made. They only wanted to CONTROL him, so they broke his body. I sure hope more tourists begin to complain and refuse to pay blood money to these Two-Legged Demons. It's a good thing I don't live in Egypt because I would be spending more time in Egyptian jails than I would be spending outside of them - I would be unable to hold back beating up or shooting Bastards like these. The Monster who did this to this baby cub should be punished to the full extent of the law, but I don't believe he'll ever spend any time behind bars. My only hope is that when he dies, he'll go to that Very Special Place in Hell where Monsters like him belong. Thanks for highlighting some of the efforts taken to help the Giza zoo retain its lost reputation and help the animals get better practice and treatment. However, I have to tell you that I really don't share much of your optimism. I try to visit the zoo frequently and look for critical changes, but truely it is always hard to find. I am not a scientist or a pro researcher but I got fair experience with zoo environments and practices and the Giza Zoo is really far from what they call abroad a 'poor' zoo. I didn't lose total hope but I certainly believe the problem is not in funds, equipments, grants, etc. I believe the main problem is PEOPLE. Get all the right tools to vitalize and improve an institution to the wrong people and be sure that none will happen. In Egypt, the problem is in the required knowledge, dedication and career consciousness that are needed to do the job in the right way. As long as you employ same people and mentalities, I doubt major improvements will happen. Just to mention, the zoo system abroad (e.g. USA, Europe, etc.) puts strict conditions for zoo keepers. The idea of the zoo is to create a habitat for the CAPTURED animals that exactly imitates their original ones and thus doesn't affect the animal's psychological or physical health. Zoo visitors should know that they are visitors who must abide with the regulations that are created to maintain the rights of the owners, the animals. Just to give you few facts I know about. Dr. Richard Hoath, a dedicated environmentalist, if you know him, who has tried to help the Giza Zoo frequent times but in vain. I believe he worked closely with Born Free Foundation in the UK, who also provided him with funds to change the status of the zoo facilities. 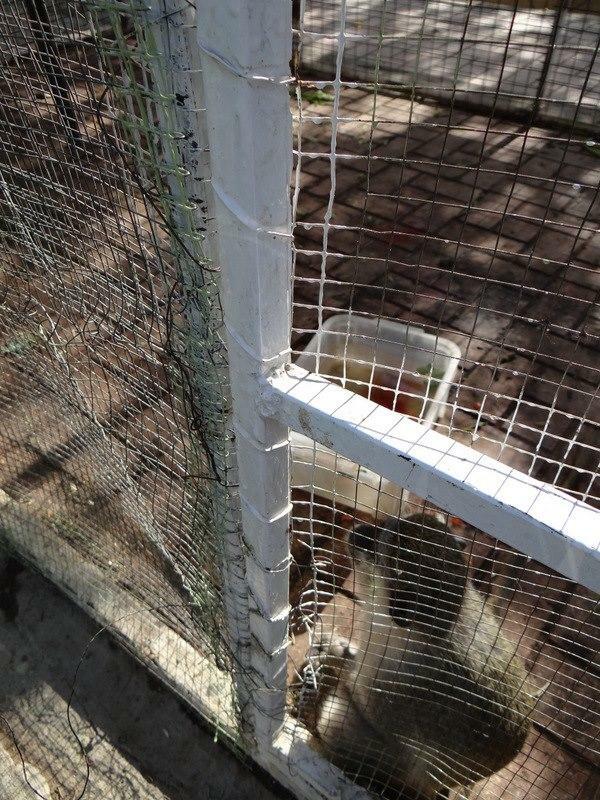 For example, bigger and cleaner cages, more appropriate drinking utilities, etc. It is sorry to mention that their funds and efforts were lost wihout proved success. By the way, try to read the nature column of Dr. Hoath in Egypt Today issue of May 2009 (which is after the dates you mentioned in your email that things gone better in the zoo). He talks in sadness about the miserable condition of the zoo and the animals. I really hope the efforts of you and your group would change something and convince the officials of long term goals for the zoo. I know lions breed like rabbits in the zoo and this is not right. Animal births in captivity should be closely monitored, recorded and well planned. I am fond of big cats, especially lions, always had and always will and it is really sad how these magnificent animals are treated in the Giza Zoo. I have recorded the status of the lions on my website for the first time in 2001 and honestly nothing much changed since then. I wish you all the luck and it is a relief to know that people like you try to change such a sad situation of a place that certainly deserves much more. Thank you for your email and expressing concern about lions at Giza Zoo. Giza Zoo: Since 2007, Revitalizing the Giza Zoo Team, was formed of various societies and groups, not only animal welfare societies, but Gardens and Treasures Society, Vegetation Society, plus various groups and activists. The call started through AWAR group. This resulted in holding several meetings with officials including Zoo Management and staff, in addition to opening link with WAZA PAAZAB (World Association for Zoos and Aquaria PAAZAB (African Association for Zoos and Aquaria)) and PAAZAB (African Association for Zoos and Aquaria). All responded to the call for revitalizing the Giza Zoo, and finally delegations from WAZA, PAAZAB and various Animal Welfare Societies including WSPA, all came to Egypt and met with officials and the team. Another meeting was set with the Minister of Agriculture and plan started. As of December 2008, the Giza Zoo was finally accepted as a member of PAAZAB. Experts and delegations were sent from/to Egypt Central Zoos Management, long term and short term plans were set. One of the major issues of concern was the big number of lions at Giza Zoo, and it was a must to address this issue. Another meeting was set with the Ministry of Agriculture related to this issue mid March, attended by delegation of PAAZAB. Plans have been set to reduce the number of Lions and to stop the breeding of Lions. 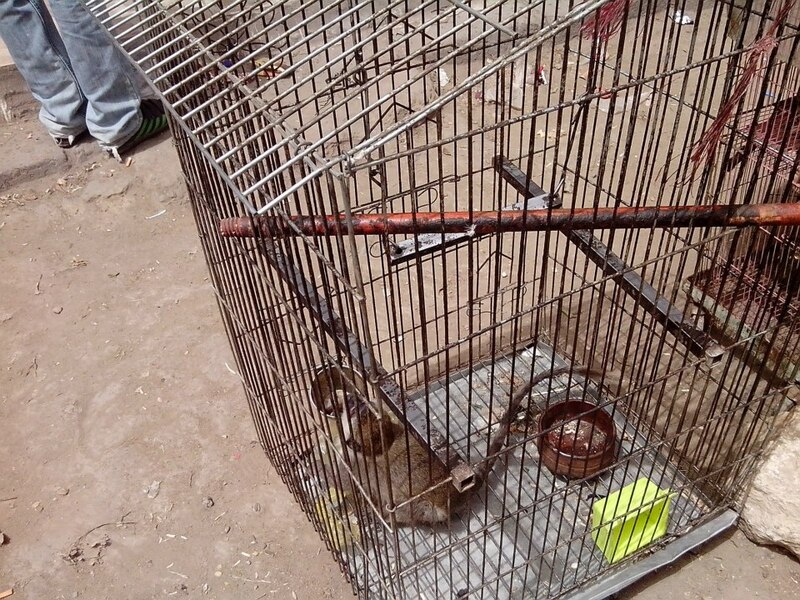 This report of the confiscated lion cub was filed at Wadi El Natroun, Cairo – Alex desert road. The cub – as stated in the report – was delivered to Giza Zoo as it is considered the official rescue center. I assure you this practice does not happen in Giza Zoo.., declawing, beating, abuse, sedating.. etc.. however I know – as well as others- that some keepers tend to make money by allowing visitors to take souvenir photos with animals. This is not approved by the management, however, if done, people must report to management and employee or keeper in charge would be punished. We hold regular awareness campaigns at Giza Zoo, sessions focused on: why people should not encourage such souvenir photos, risk to public safety, the diseases transmitted form man to animal, animal to man..etc.. We must get the people involved.. make them aware of such practices.. make them more involved as such crimes involves demand of people for those photo sessions.. These practices exists at various restaurants, night clubs, rest houses and perhaps in many private facilities.. we urge people to take action, report to authorities. Stand against these practices aiming that one day these appalling conditions stop. I would very much like to send you and to all video of the session held at Giza Zoo, the response of the public was great. However, I see that these campaigns must be held regularly and I hope that people who care to mitigate the suffering act positively by supporting these campaigns and by writing to authorities and reporting if they see such practice. We must keep the pressure on… by acting positive, AW societies cannot do this alone, this has to be done with the support of people who care. Powerless are precious.. Act. Don’t react. See a need, fix it first. Worry about the details later. If you wait until you are asked you have just missed a golden opportunity. They are fleeting and rare. None of us is as smart as all of us. Synergy means 2 plus 2 equals 5.There is nothing we can’t achieve if we don’t care who gets the credit for it. I can't describe to you how sick I felt after viewing the picture of this cub that has been literaly tortured for the sake of taking some dumb pictures. I have several hand on experiences with lions and I never saw a lion so devastated and miserable like the one in the picture. This make me wonder about the status of the lions in the Giza Zoo. I quiet honestly believe that many of them are not far from reaching the same sad end of the cub in the picture. I called her back immediately, she said she is now in the Police Unit of Moharam Bek Alexandria, to file a police report about a lion cub being held and displayed in Balbaa restaurant. The commissioner of the police unit of Moharam Bek refused to file the report as he said she must be authorized by a concerned party, ie. Environment or else, she told him as an individual I like to report this, he said: what harm did what you see (lion cub) cause to you? She said according to environmental law for year 1994, clause 28 this is a wildlife and should not be displayed except in places authorized, this harms the tourism. He said he cannot do so. I told Dr. Rania to stay in her place in the police unit and wait for my call. I called the telephone information, asked for the contact telephone number commissioner of police unit of Moharam Bek, Alexandria. 034961666. I called the number, and was transferred by the operator. I asked the Police commissioner: brigadier generalMohamed Hassan, why did he refuse to file the report. I told him: But we need to provide evidence that this lion cub is here now before we call the environmental police . I said: The Environmental police would be in charge of confiscation, but now we need to state in files that this lion cub is here. He said: You have no right, I can see no damage done to you. I said: We will do so, but until we do we want to have evidence, they may hide the lion cub by the time the environmental police heads to the restaurant. He said: I understand but please understand that if I make file I have to have the lion cub arrested.. I can't have the lion cub here. I told him: Can I make contacts with Wildlife manager Dr. Ragi Thoma and make him talk to you to just make a file that there is a lion cub here, then we would proceed and talk immediately to the environmental police unit to confiscate. I telephoned Dr. Ragi, who as Christian had the day off, Christians are celebrating Eastern. I fascilitated him for the feast and then I told him I had to bother him because we need his help. I told him the story and gave him the telephone number of the Police Commissioner Mohamed Hassan. After 5 minutes I called Dr. Ragi, he said he is after him, the line is busy. I kept trying, the operator answered I talked to the commissioner and asked him for his mobile number as Dr. Ragi Thoma requests talking to him but line is busy. I dictated the number to Dr. Ragi. After 5 minutes Dr. Ragi talked back to me. He said, he explained to the commissioner that the restaurant is violating laws by keeping in a lion cub, at the same time he understands that the police unit cannot make confiscation. He asked the commissioner to state the situation as it is, meaning , a record of the state: there is a lion cub now displayed at Balbaa restaurant. The commissioner agreed. Dr. Rania is now making the complaint. Once done, I will talk to environmental police to take action. BRAVO RANIA, BRAVO for acting right, persistence and insistence. All the cases filed should have been escalated in courts, however we failed escalating the first report after the Giza Zoo Management provided pathology report, because we did not find any law office in Egypt to file the case, even though Born Free Foundation offered covering the expenses of a law suit. Urging all to take positive action, reporting to officials and filing police reports, all data of officials, contacts, emails, telephones are uploaded, pls refer to link provided. we need to keep the pressure on.